Make us your stayover spot for your whole Central Coast exploration vacation! Rustic, dry tent camping is offered at our rear park on a daily or weekly basis. But camping doesn’t have to be rough! We offer parking for RVs under 25 feet and our Vacation rental cabins offer one queen bed and 2 bunk beds that sleep 1-4 friendly people. Each Cavco manufactured wood-sided cabins also include a kitchen, dining and living area. Click here to view map of the property. Rustic, dry tent camping is offered at our rear park on a daily or weekly basis. Groups are welcome. During the spring and summer, seasonal overflow lawn camping is offered at the front park. During spring and summer spaces are limited and reservations are highly recommended. During high peak periods, not all tent sites offer picnic benches or fire pits. Wood fires and charcoal BBQ's are not allowed in overflow tent camping. You are welcome to bring portable propane grills. Ground fires are dangerous and are not allowed. No dogs allowed in tent sites. We also now offer RV sites, for RVs that are 25ft or less. 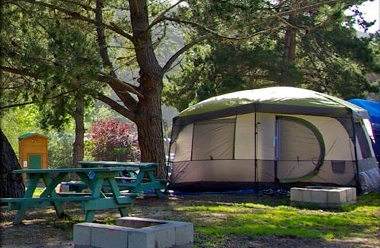 $45.00/NIGHT FOR 2 PEOPLE AND 1 TENT or RV. ADDITIONAL $10/NIGHT FOR EACH ADDITIONAL PERSON, MAXIMUM 6 PEOPLE. EACH ADDITIONAL CAR IS $5/NIGHT. CHILDREN TWO YEARS AND UNDER ARE FREE. Two week maximum stay. Nonrefundable reservation fee $10. Each night stay includes one free pass per person to pool and hot springs. Primitive, compact dry sites fit 1 tent only! RVs must be 25ft or less. 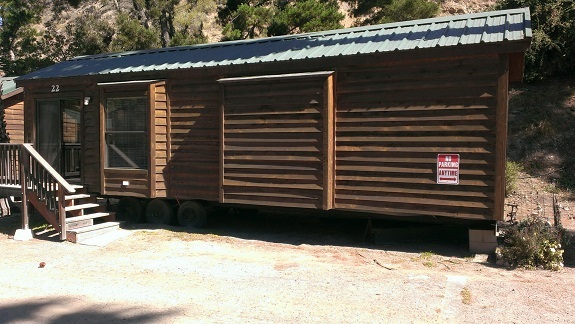 Avila's 1 bedroom/1 bath wood-sided Cavco manufactured cabins include a kitchen, dining and living area, a Queen and two single bunk beds, and can sleep 1-4 friendly people. (Extra persons up to 6 are allowed with extra charge and must bring sleeping bags or bedding.) 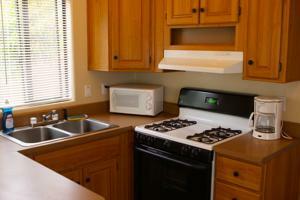 Cabins have TV's with expanded Basic Cable, refrigerator and microwave. No telephone. Wi-Fi is offered in the main building. Cabins have basic cooking supplies (Pots, pans, bowls, plates, glasses, mugs, and flatware). Daily maid service is not provided but there is a coin-operated Laundromat on site. Cabins are subject to Seasonal and Holiday rates, please confirm rates when reserving.Cabins can also be rented on a month to month basis. Click here to learn more.